Ooredoo and Qatar Airways today signed a Memorandum of Understanding (MoU) that will see Ooredoo sponsor Qatar Airways’ Onboard Wi-Fi service to enhance the customer experience on Qatar Airways flights and provide unmatched connectivity in the air. The MoU was signed by Ooredoo Qatar CEO Waleed Al Sayed and Qatar Airways Group Chief Executive Akbar Al Baker. With the Onboard Wi-Fi service, customers can use portable electronic devices (PEDs) to access emails, browse the Internet and also send SMS/MMS via their smartphones once the service is enabled on board. The three-year agreement positions Ooredoo as the Exclusive Onboard Wi-Fi Sponsor for all Qatar Airways flights that are equipped with on board Wi-Fi. “Qatar Airways continues to strive to offer the very best on-board experience for our customers, and our cutting-edge on board Wi-Fi service provides an incredible connection. 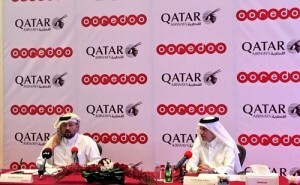 We are proud to work with Ooredoo, a leading Qatari company, to bring this service to the world,” Qatar Airways CEO said. 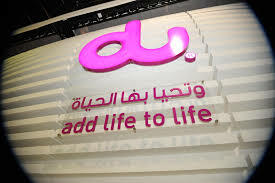 Ooredoo Qatar CEO said: “Ooredoo strives to ensure that customers can always enjoy the best network wherever they are in the world, and our partnership with Qatar Airways takes our commitment to connectivity to the skies. Qatar is leading the way in the incredible facilities being offered to visitors and residents, and we are pleased to extend our work with Qatar Airways through this important agreement.” With Ooredoo’s sponsorship, all passengers can enjoy the first fifteen minutes of Wi-Fi for free, enabling them to contact loved ones on the ground. After the free period, customers will be able to continue using the Wi-Fi service by entering their credit card details when prompted. Passengers on the Qatar Airways flights will be made aware that the network is available with the Ooredoo logo on the log-in screen, crew announcements, in-seat pocket information and on-flight screen adverts. The move to enable Ooredoo’s network on board aircraft will enable Qatar Airways to give travellers the latest generation of connections quickly and cost-effectively, in a flexible and scalable manner. This agreement is the latest in a line of cutting-edge initiatives between Qatar Airways and Ooredoo, which include an initiative by the national airline to move both its primary and backup data to Ooredoo’s cloud-hosting platform, announced earlier this year. On-board Wi-Fi is part of Qatar Airways’ state-of-the-art communications system available on all A380, A350, B787, A319, and select A320 and A330.